The Cisco ASA Appliance with FirePOWER Services when deployed in Active/Standby failover mode it offers device level redundancy. 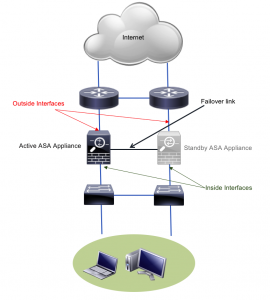 However only one unit of ASA appliance remains in active mode , where as the other ASA Appliance of the failover pair remain in standby mode. Active unit accepts all the configuration commands from the user and replicate the same with Standby Unit. All transit traffic is processed. Applies security policies , build and tear down connections . Synchronises all the connection information like global pool addresses, translation table for NAT, TCP/UDP states, ARP table and many other details with the standby unit provided its configured in Stateful failover mode. Forwards all the syslog messages and Netflow Secure Event Logging (NSEL) to the destined event or log collector. The standby device is not capable of processing any traffic it receives , it simply drops all the transit traffic and only accepts the management connections. The Standby ASA Appliance becomes fully active automatically, provided that the active ASA appliance becomes less operational healthy than its peer. When it comes to designing a network one may need to think from many aspects, one such aspect happens to be the scalability. It’s been observed most of the SMBs rely purely on their team to choose the technology or the product. This fits true especially when they want to upgrade their old router with a new one. The challenge of selecting a right product with no design experience is quite hard and often it’s been observed most of the SMBs end up either buying a lower specs device or much high end device. 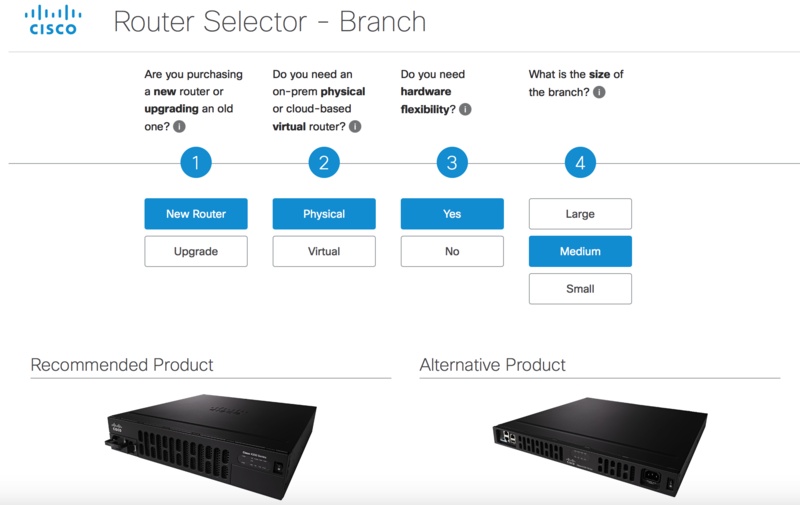 To overcome this challenge for Cisco Routers,Cisco is ffering Cisco Router Selector to select a right router which fits the need of an Organization. By simply answering few questions one can identity the right Cisco router one might require , currently the Cisco Router Selector allows one to select Branch Routers and Network Edge Routers . The tool recommends the Cisco Edge router based on the encryption throughput, is the router physical or virtual, which is fine for SMBs. It’s a good offering from Cisco, as one could have an idea of what they want buy, however this tool cannot replace the task of Network designers and architects as they design networks from many dimensions few of them are business need of the customer, functional requirements, technical requirements, user experience etc. 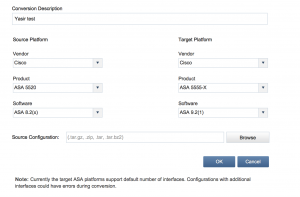 Migrating a Cisco ASA Firewall from older Cisco ASA platform to another Cisco ASA 5500 or 5500-X series platform or even from older ASA Version 7.2 (x), 8.0(x),8.1(x) or 8.2(x) to 9.1 (x) or 9.2(x) version, then one can rely on Cisco FWM portal. This web based portal provides a unified interface to migrate configuration conversions in secured manner to the desired Cisco ASA platform with very little effort. Firewall migration tools either in form of a virtual machine or a web portal provides good review for the migration planned from one version to another or from one vendor to another. But it’s hard to completely rely on them as they might miss out few things. The Cisco FWM portal provides a good platform to plan the firewall migrations. Cisco is supposed to offer migration for Juniper SRX Firewalls and Checkpoint Firewalls, however currently the its not offered, however Cisco claims this will be offered soon. The migration process is quite easy, one simply needs to follow the instructions mentioned in the web portal to get the converted file . Based on experience, we recommend not to rely completely on the converted file as there will be few errors in conversion. However, it proves to be a good reference file one could have while planning the migration from one trial version of ASA software to another. Currently Cisco Firepower Threat Defense (FTD) unified software can be deployed on Cisco Firepower 4100 Series and the Firepower 9300 appliances as well the FTD can be also be deployed on Cisco Firepower Threat Defense (FTD) ASA 5506-X, ASA 5506H-X, ASA 5506W-X, ASA 5508-X, ASA 5512-X, ASA 5515-X, ASA 5516-X, ASA 5525-X, ASA 5545-X, and ASA 5555-X. However, the Cisco Firepower Threat Defense (FTD) unified software cannot be deployed on Cisco ASA 5505 and 5585-X Series appliances. The lack of VPN function is a major drawback which Cisco needs to overcome in upcoming release of Cisco Firepower Threat Defense image. This certainly discourages the enterprise customers to adopt the Cisco Firepower Threat Defense unified image on their supported ASA 5500- Series platforms. The protection License is used to perform intrusion detection and prevention, file control, and security intelligence filtering. The Control License is used to implement user and application control. The protection license allows one to create access control polices based on user id and application setting however those rules cannot have applied unless Control license is installed and enable it in the ASA FirePOWER Module. 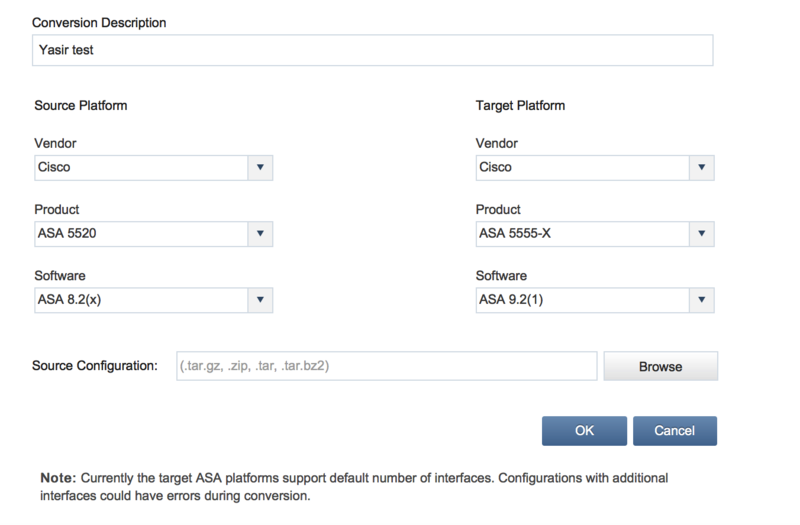 The Malware License enables Advanced Malware Protection (AMP) in the Cisco ASA FirePOWER module. Basically with this license one detect and block malware potentially transmitted over the network. The URL Filtering License is used allow or block the traffic passing through the ASA Firewall based on URLs categories, individual URL or group of URLs. An access control policy is created for this action. One can really mix and match these licenses in the Cisco ASA FirePOWER module based on the business need. The recent claims by Shadow Brokers group to have stolen hacking tools which might belong to the National Security Agency (NSA) has drawn interest of major Security vendors. Cisco did acknowledge that there is a vulnerability in the Simple Network Management Protocol (SNMP) code of Cisco Adaptive Security Appliance (ASA) software, which could allow an authenticated remote attacker to cause a reload of the affected ASA or simply the attacker can execute the code remotely. The only prerequisite to exploit this vulnerability is to know SNMP community string in SNMP version 1 and SNMP version 2c or a valid username and password for SNMP version 3. Initially a work around was offered by Cisco is to ensure that only trusted users to have an SNMP access to Cisco Security Products using the snmp-server host command. Well this falls under best practices and one should always follow the recommended best security practices. Those who are following the recommended best security practice are safe. It’s worth to revisit all the Cisco Security Appliance configuration and do a thorough review. The new software fix issued by Cisco ensures that major software trails of the ASA are affected and it needs an upgrade to 9.x (ASA) trail, which means one should ensure the hardware they are using have enough memory. It’s better to contact Cisco TAC to seek their advice on how to proceed on the upgrade. Cisco ASA FirePOWER module can be configured in promiscuous monitor-only mode also known as passive mode. As the name suggests, in passive mode the Cisco ASA FirePOWER module does nothing to the traffic passes through it. Rather the ASA just forwards a copy of the packet to Cisco ASA FirePOWER module. Suppose IPsec or SSL VPN is configured them the incoming encrypted traffic is decrypted. Firewall policies are applied to the decrypted traffic. If the received traffic is complaint and allowed by the ASA policies them a copy traffic is sent to the ASA FirePOWER module. If the traffic is not complaint with security policies or it is malicious in nature, then the Cisco ASA FirePOWER module can be configured to send an alert to Network Security Administrator, however it cannot take any action to stop the malicious or non-complainant traffic. The processed traffic is then forwarded to respective interface, in this case its an Inside interface. One can see the real benefit of Cisco ASA FirePOWER module in Inline mode, as the Promiscuous monitor-only (passive) mode has no capability to take any action on an infected or non-complaint traffic. Rather it might be useful for POCs and even good for capacity planning for any new deployments. In an inline mode, the traffic passes through the configured ASA firewall polices and then the traffic is sent to the ASA FirePOWER module for further action. The below figure illustrates the complete order of operation of the Cisco ASA FirePOWER module in an Inline mode. Traffic sent from Host A is received by an Outside interface of the ASA Firewall. If the received traffic is complaint and allowed by the ASA policies them the traffic is sent to the ASA FirePOWER module. The Cisco ASA FirePOWER module then applies its security policy to the traffic, and takes an appropriate action. If the traffic is not complaint with security policies or it is malicious in nature, then the Cisco ASA FirePOWER module send back its verdict to the ASA to block the traffic and ASA also sent an alerts to Network Security Administrator. Suppose the traffic is valid, then the ASA allows the traffic to pass though. Suppose IPsec or SSL VPN is configured them the decrypted traffic is encrypted back. The processed traffic is then forwarded to respective interface, in this case its Inside interface. Only Cisco knows how the traffic is processed in the Cisco ASA Next Generation Firewall at the hardware level, also at the same time there are very few deployment option Cisco offers with their Next Generation Security solutions. As we all know Cisco jumped into Next Generation Firewall segment, though they are late yet they are trying sell their next-generation firewall services, including Next-Generation Intrusion Prevention System (NGIPS), Application Visibility and Control (AVC), URL filtering, and Advanced Malware Protection (AMP) in form of Cisco ASA FirePOWER Services. Cisco offers FirePOWER services either in the form or hardware module or software based security module. The newly introduced features by Cisco provides a good control over the types of application one can allow based on the user identity. It’s interesting to see how decryption part going work, as it really needs good hardware to intercept the encrypted traffic and take an appropriate action. 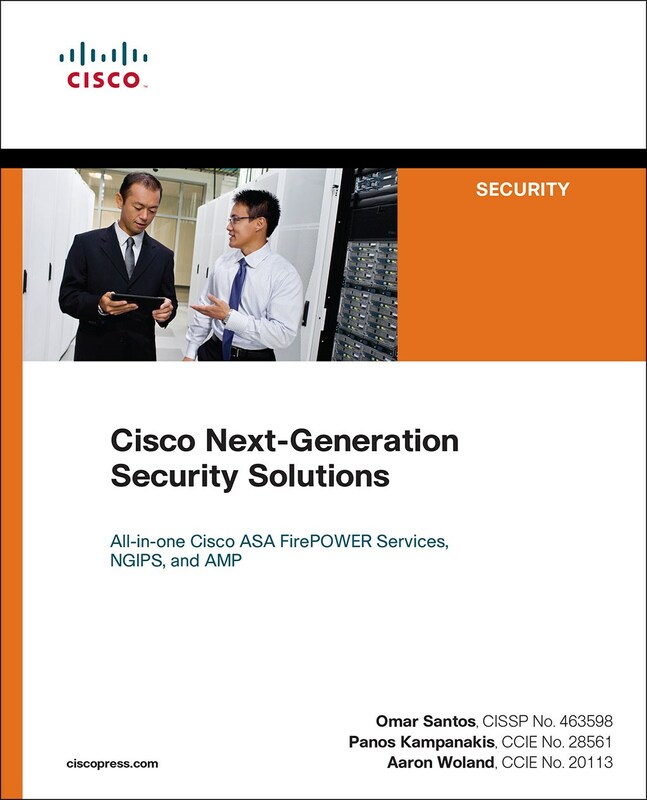 The newly released Cisco Press title “Cisco Next-Generation Security Solutions” seems to be a great resource which deals with Cisco ASA FirePOWER Services, NGIPS and AMP. Thanks to Cisco Press for sharing the eBook with me. I have been eagerly waiting for this title as I was keen to know how Cisco Next-Generation Firewalls are? And how Cisco is going to bundle their Next-Generation features into the Cisco ASA firewall. This title deals only the new concepts, Cisco introduced with their Next-Generation Security Solutions like how Cisco ASA works with FirePOWER services? How different models of Cisco ASA 5500-X Series Firewalls can be integrated with FirePOWER modules? What is AMP? etc. The introductory chapter “Fundamentals of Cisco Next-Generation Security” is well crafted by the authors as its quite simple and it does gives the brief over view of Cisco’s Next-Generation Security solutions like ASA 5500-X Series Firewalls with FirePOWER modules, Next-Generation Intrusion Prevention Systems (NGIPS), Cisco AMP for End points, Networks and for Cloud Solutions. The design chapter is my personnel favourite chapter, as it showcases how the Cisco ASA FirePOWER modules can be deployed in real world networks, what management options one can avail to manage the Cisco ASA FirePOWER module. Chapter 4 deals with troubleshooting Cisco ASA with FirePOWER services and Firepower Threat Defense (FTD) is interesting as it demonstrates how to troubleshoot common problems one may occur while deploying the Cisco ASA FirePOWER Service module and the Firepower Threat Defense Software. The title is well written and does leaves up to the standards of Cisco Press titles, however I felt if little more emphasis was given to elaborate the Cisco ASA FirePOWER Packet Processing Order. I am keen to see how the packet is processed at the hard level, especially would love to see how the next-generation features are enabled. I hope this would be addressed in the next edition. Over all the title is a great resource to understand how Cisco Press title Cisco Next-Generation Security Solutions works and one can rely on this title to have a better understanding of the newly introduced concepts by Cisco. Also this title is recommended book for the Cisco CCIE Security written and practical exam.